The release of the Crystal Cave Adventure series is an exciting step that blends fun adventure stories with science. In today’s world when Science, Technology, Engineering, and Math (STEM) curriculum is all the rage, a novel series that can transport kids to a story that is fictional yet has a touch of real science woven throughout the series is a welcome change to many children. The series, which just released its third book, tells the adventures of young teenagers Emma and Brody as they travel through time to collect rare mineral samples from around the world. In Book 1, Blue John’s Cavern, Emma meets Brody, her new neighbor in Diamond Falls, West Virginia. When Brody discovers that Emma loves rocks and minerals, he offers to take her to meet the famous geologist who lives across the street, Heath Matthews. Mr. M, as the kids call him, is preparing his prized rock and mineral collection for a display at the State’s Natural History Museum. When a thief breaks into the Matthews’ home and destroys the collection, Emma and Brody offer to help recollect the samples. Mr. M gladly accepts the help and then sends Emma and Brody on the wildest ride of their lives when they learn the secret of his collection. The magical, time-traveling Crystal Cave. Book 1, Blue John’s Cavern. After accepting their offer to help, Mr. M promptly sends Emma and Brody is Castleton, Derbyshire England in 1785 to collect a sample of the rare Blue John Fluorite. You can read the full book blurb here to learn more about this amazing adventure and the mysterious young girl who helps them along the way. Book 2, Rusher’s Gold. Emma and Brody travel to the California Gold Run in 1851 to collect a sample of pure gold but when their plan goes awry they learn that their actions in the past can have dire consequences to their future. You can read the full book blurb here. Book 3, Black’s Opal. Emma and Brody travel to Lightning Ridge, Australia in 1925 to collect a sample of one of the rarest minerals, the Black Opal. Along the way, they meet a young girl with a secret that just may change their lives forever. As they search for the Black Opal, the kids must avoid stampeding kangaroo, flying boomerangs and survive a goat cart race at the Easter fair. When their escape plan lands them 2000 years into the future, will they be able to get back home? You can read the full book blurb here. The Crystal Cave Adventure series has a self-contained story in each book with a story arc that carries through all of the books. As they solve one mystery, another mystery begins. The Crystal Cave Adventure series is available in eBook and paperback at all major retailers. 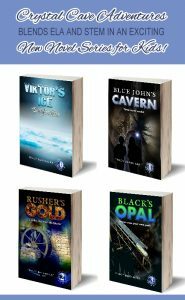 For a free introduction into the series, you can download a copy of Viktor’s Ice, the prequel novella which tells the story of the birth of the Crystal Cave. When Mr. M and his students discover the magical cave and fall hundreds of years into the past, can they survive being stranded in the Arctic Ocean with a longship full of Vikings? What mineral will they find that just might save the day? You can get a free copy at Mini Me Geology, the Author’s Website, or from Prolific Works (formerly Instafreebie). The Crystal Cave Adventure series is written by a geologist, Tracy Barnhart, who loves all things geology, adventure and time travel! The series is published by Giverny Press.